Visitors to the Big Cat Sanctuary, Ashford, Kent, can now benefit from an improved viewing and eating experience thanks to the “Lion Proof” glass supplied and installed by specialist window company – Britelite and the new glass roof designed and manufactured by Ultraframe and installed by Britelite craftsman. More than 5 large viewing windows now separate the cafe/restaurant from two magnificent lions (Kafara & Tiny). The public will now be able to see these animals easily and up-close through 36mm toughened laminated glass that will maintain its transparency and clarity, while being protected by a structure strong enough to withstand the weight and power of these 2 large lions weighing over 28 stone each! 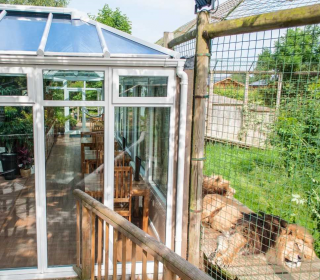 The refurbishment of the cafe and restaurant was designed specifically for the lion enclosure to combine anti-reflective properties with maximum strength together with high levels of safety and security. The new glass roof specially designed by the market leaders – Ultraframe combines clarity and much improved light levels.